Last Saturday, April 28th, while Luis Leon Sanchez was busy taking a stage win at the Tour of Romandie, over 500 citizens in southern California rode their own stage race. It has now become tradition that the Amgen Tour of California offer the opportunity for citizens to ride a complete stage of the tour on closed road conditions. For every rider out there, if the day did not feel like a race, it certainly felt like a challenge. The stage of the 2012 L'Etape du California takes riders to the top of Mt Baldy which is Stage 7 of this year's Tour of California. Remember last year when Matthew Busche (RadioShack) set a blistering pace up the mountain for his teammates Levi Leipheimer and Chris Horner? Well the climb is steep and certainly worthy of a UCI 2.HC stage race mountain top finish. Most impressive was the top 20 finishers of Saturday's L'Etape du California - look at the age ranges in this lead group of riders. If anything should motivate an amateur to keep riding their bike, this top 20 results list for the 2012 L'Etape du California should do it. Please click to enlarge this image below - Wayne Stetina at age 58, uncle to Peter Stetina of ProTeam Garmin-Baracuda, former U.S. National Road Champion, and Vice President of the bicycle division of Shimano American, came in 4th! Rich Mull of Malibu, came in 12th at age 60! Dean Hall, age 21, came in 17th. Local Nate Whitman of Los Angeles won by 5 minutes, he is 36-years old. 533 citizen cyclists completed the challenge. Read more about the event and route: L'Etape du California is back for 2012. Watch the pros race Stage 7 of the Amgen Tour of California on Saturday, May 19, 2012. Read the full 2012 l'Etape du California results list. Read about the event and route: L'Etape du California is back for 2012. 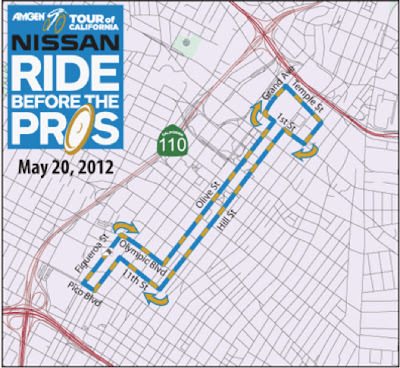 The 'Nissan Ride Before the Pros,' taking place in downtown Los Angeles on Sunday May 20, 2012 from 8-9:30 a.m., will allow cyclists of all levels to ride on a 5-mile, closed-circuit course that will be part of the 2012 Amgen Tour of California's eighth and final stage takingplace that same day. 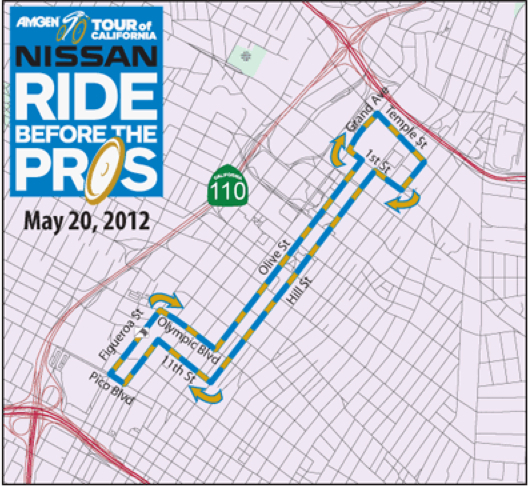 Free to participants of all experience levels, the 'Nissan Ride Before the Pros' will begin and end at the official finish line where the professional riders competing in the 2012 Amgen Tour of California will cross to complete the 42.6-mile stage they started in Beverly Hills on Rodeo Drive earlier in the day. Read more on the official Amgen Tour of California website: Nissan Ride Before the Pros. Bring the kids and family - the next Dave Zabriskie (who lives locally in Los Angeles) could be in the crowd, waiting to be inspired. Bring the Grandparents too - the next winner of L'Etape du California could be there too. If 5-miles is not enough, you could be one of the select few citizens who will be joining the Chris Carmichael "Going Pro" team and riding prior to the pros at every stage of the 2012 Amgen Tour of California. How this will work out logistically still baffles my mind, but you can read more about it here, (keep in mind it'll cost you $11,500): 2012 CTS Amgen Tour of California Race Experience. This same experience will be offered at the USA Pro Cycling Challenge in Colorado in August 2012.